Identification: Hydrilla is a rooted, submerged, vascular, and perennial aquatic plant found in freshwater habitats such as canals, springs, streams, ponds, lakes, rivers, and reservoirs. The long, slender, whitish or light brown roots are found buried in the hydrosoil or forming at nodes. The ascending stems growing from the hydrosoil are usually long and branched. Near the surface, these stems will become horizontal and intertwine to form dense mats. 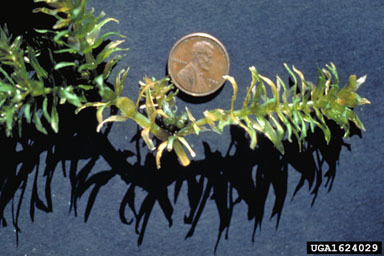 About 20% of the plant's total biomass can be found in the top 10 cm of the densely intertwined surface mats. Below the hydrosoil the creeping, horizontal stems produce stolons. The leaves, which are about 1-2 cm in length, are sessile and veticillate (located in a whorled pattern) about the stem. There are usually three to eight blades per node and the apical stem usually has tightly clustered nodes. Each blade is serrated, with visible teeth or irregular spines along the margin and the on underside along the reddish mid-vein. Each leaf also has a small spine and at the base of the leaf there are small nodal scales that are lanceolate, haline and densely fringed with orange-brown frimbrae. The flowers are unisexual, singular and enclosed by spathes. The female flower is translucent, white and has three broadly ovate petals. The male flower is of similar shape and size and is free floating at maturity. Importantly, there are two biotypes of hydrilla found in the U.S. The first is dioecious, meaning they only have the flowers of a male or female plant. The second type is monecious, having the flowers of both sexes. The cylindrical fruit are about 5 to 10 mm in length and often have spine like processes. The 2 to 3 mm seeds are smooth, brown and can be found in groups of five or less in a single linear sequence. Hydrilla also produces two types of hibernacula, tubers and turions. Original Distribution: There are three different schools of thought about the origin of hydrilla. Many think that hydrilla is originally a native of the warmer climates of Asia, including Sri Lanka, which is where it was first imported from. Others believe that it originated in central Africa because some of the earliest evidence of its collection exists from a 1860-1863 expedition searching for the source of the Nile in southeastern Uganda and northwestern Tanzania. Lastly, some feel that hydrilla originated in Australia because of records that document the plant during the early nineteenth century after the arrival of European settlers to Australia. Current Distribution: Hydrilla verticillata can be found on all continents except Antarctica and South America. Hydrilla is most common in Middle Eastern countries, southeast Asia, northern and eastern Australia, and the Indian subcontinent. Although it is found in temperate areas, it is most widespread in tropical regions. The species is found as far south as the north island of New Zealand (approximately 40°S latitude) and as far north as Ireland, England, Poland, Lithuania and Siberia (where the northernmost latitude is 55°N). Nearly all of the continental United States and Hawaii lies below 48 degrees latitude so it is climatically suited for hydrilla ( Even Alaska is at risk because part of it lies at the same latitude as Lithuania and Siberia). Consequently, hydrilla has become a common invasive problem within the United States, mainly within the South. Hydrilla now infests nearly all major drainage basins in the state of Florida, and a good portion of drainage basins in other southern gulf states including Louisiana, Georgia, Mississippi, Alabama, and Texas. It can also be found in drainage basins or waterways located in Washington, Oregon, California, Arizona, Tennessee, North Carolina, South Carolina, Virginia, Maryland, Delaware, Connecticut, Massachusetts, and Pennsylvania. The most pressing question and concern is exactly how far north will Hydrilla spread, and will it be as much of a problem in the northern U.S. as it is in the southern. Site and Date of Introduction: Hydrilla was first imported from Ceylon (Sri Lanka) in 1947 by an aquatic plant dealer in St. Louis, Missouri for use as an aquatic ornamental. In the early 1950s, around 1951 or 1952, Hydrilla was introduced to the Tampa Bay area of Florida when an aquatic plant dealer was said to have discarded six large bundles of Hydrilla into the canals near his business. It was in the 1960s that Hydrilla was first identified in the Crystal River located in south Florida. It was at this point that it was discovered that Hydrilla had rapidly spread throughout the entire state of Florida. By the 1970s, the plant had invaded every major drainage basin in Florida. In the 1980s, about twenty thousand infested acres were being managed but it was estimated by the Florida Department of Natural Resources that nearly fifty thousand acres, not including the managed twenty thousand, had been successfully invaded by Hydrilla. In 1992 it was further estimated that Hydrilla occupied nearly forty-two percent of all of Florida's open waters and infested nearly seventy-five thousand acres. In California, some of the earliest introductions have been traced to shipments of waterlilies. Further introduction of the Hydrilla across the United States has been facilitated by the ease with which it spreads. Mode(s) of Introduction: The initial modes of introduction were both intentional and accidental. The intentional mode included the human use of hydrilla as an aquatic ornamental species, leading to the accidental spread of hydrilla through the dumping of private aquatic systems into the natural waterways of Florida. Accidental spread was most commonly achieved by the hitchhiking of small hydrilla fragments on water vehicles including boats, bait buckets, draglines, motors and trailers to new water systems. Interestingly, recent DNA tests of hydrilla from around the world and their similarity to the diversity of hydrilla in the U.S. suggest that there were multiple introductions to the United States from different origins. The Dioecious type are similar to samples from the Indian subcontinent and the monoecious variety resembles several South Korean varieties. Reason(s) Why it has Become Established: There are several characteristics that enable the hydrilla water plant to effectively out-compete the native vegetation and establish itself. Such characteristics include its rapid modes of growth and spread. Small fragments of the plant, as long as they contain at least a single node can grow roots and develop into an entire plant. Furthermore, Hydrilla has four methods of reproduction, which are fragmentation, tubers, turions and seeds. Research shows that one tuber can lead to the growth of nearly five thousand per square meter of new tubers. Their subterranean turions can survive several days out of water, nearly four years in undisturbed sediment, and the ingestion and regurgitation by waterfowl. The hardiness and viability of these tubers and turions allow the plant to quickly and effectively re-infest after events of drought and herbicide applications. The hydrilla plant is also a little bit of a habitat generalist. It is found in shallow and deep waters, anywhere from 0.5 to 15 m deep, as long as the deep water environs have very clear water. Its depth range can be attributed to its ability to propagate at lower light intensities for photosynthesis than most other plants, making it difficult for other plants to shade it out. The species also requires very little nutrients to create its biomass because ninety percent of its tissue composition is water. Hydrilla can absorb carbon more efficiently than other species, as well as store phosphorus for times when the phosphorus resources are limited. Lastly, the plant can thrive in a wide variety of water conditions. It can tolerate salinity (up to 33 percent of sea water), acidity, alkalinity, oligotrophic waters, eutrophic waters, and water heavily polluted by sewage. Highly organic sediments contribute to its optimal growth but it can also survive in sandy or rocky substrates. It should be seen from these attributes that once established, Hydrilla is very difficult to eradicate. Ecological Role: The hydrilla species is rather gregarious, or is given to living in communities in association with others of the same species. It is known for completely dominating the ecosystems which it invades so that it decreases biodiversity and alters the existing ecology. Hydrilla forms stands of large monocultures that can be hundreds of acres in size, and it is notorious because of its effective ability to displace native species as well as interrupt patterns of natural water movement. The dense mats that it forms can also hamper the predatory ability of some fish, creating a food chain predominately ruled by small insectivores. Lastly, the plant can degrade water quality by changing the amounts of dissolved oxygen, pH and other water characteristics. Benefit(s): There are not many benefits to the invasion of the hydrilla plant. Some fishermen believe that the plant is beneficial to the habitat of the largemouth bass. However, their research shows that at levels of over thirty percent coverage the plant is actually detrimental to sportfish. Others like to think that it is an aesthetically pleasing plant, especially because it creates environments with clearer water. It is also still used by many as a hardy ornamental for aquarium environments. Lastly, it provides food for several types of waterfowl. There are some scientists who advocate for hydrilla because it increases the feeding habitat for these waterfowl. Threat(s): Invasion by Hydrilla results in extensive economical and ecological damage. It clogs waterways, interrupting irrigation structures, inhibiting hydroelectric power and interrupting many commercial operations by impeding boat movement, especially by getting caught up in propellors. Hydrilla is a huge impediment to tourism and can lower real estate values. The economic consequence is steep. It includes both the damage incurred by hydrilla as well as attempts at controlling and eradicating it. Control Level Diagnosis: Hydrilla verticillata should be given the "Highest Priority" diagnosis because the threats heavily outweigh the benefits. The impact of this species upon its invaded environment is overwhelming and destructive. Its rapid spread and complete dominance of invaded environs suggest at the very least that Hydrilla should be maintained if not eradicated. It is already identified within the noxious weed laws of nine states and many other states have already instituted programs for its control. Eradication has been successful only in a few areas, including Arizona and California. Control Method: Extensive biological research has been conducted in order to better find a method of control and eradication. No substantial success was achieved until the mid-1980s when fluridone (sonar) was used. It could be used on an entire lake and it could be a pretty selective process but it is a costly and time-consuming process. Mechanical control has been attempted but has proven to be too costly, often taking up to six harvests a year due to the high reproduction rate of the plant. Biological control has also been tested but failed as well, accidentally introducing a few new invasive species. It seems that early detection and eradication, once the introduction of hydrilla has been detected, remains to be the most important control method.